Living A Whole Life: What's In Your Medicine Cabinet?? A really great natural remedy to keep on hand for home emergencies is a small bottle of Tea Tree Oil. 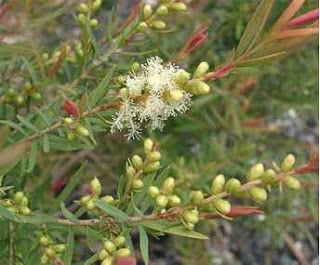 Tea tree oil is a pale essential oil taken from the leaves of the Melaleuca alternifolia which is native to the northeast cost of New South Wales, Australia. Tea tree oil undiluted has a very strong camphoraceous odor (or as my husband described it "like gasoline"). No really it's not that strong. This oil has several very helpful uses around the house. Pick yourself up a bottle of this wonderful home remedy. You can add it to your shampoo; dilute with distilled water, or cold pressed vegetable oil to make a rinse or salve. You can add a teaspoon of tea tree oil to a cup of water or natural soap for a wonderful disinfectant spray or wash that will even kill mold or mildew around the house. One word of caution, tea tree oil is harmful when swallowed. It has been reported to cause drowsiness, confusion, hallucinations, coma, unsteadiness, weakness, vomiting, diarrhea, stomach upset, blood cell abnormalities, and severe rashes. It should be kept away from pets and children. Labels: Children's Remedies, Cleaning and Household Items, Home Remedies, What's in Your Medicine Cabinet?? I have used Tea Tree Oil for bug bites with wonderful success. Awesome! I actually have some shampoo, conditioner, and body wash from Trader Joes that has Tea Tree oil in it! I'm glad it is so great! Big fan of tea tree oil here! I always have a supply in my medicine cabinet. I also have some tea tree oil, because I use it in my OCM blend. I didn't know that I could use it on warts and cold sores though! Will most definitely remember that. Thanks!